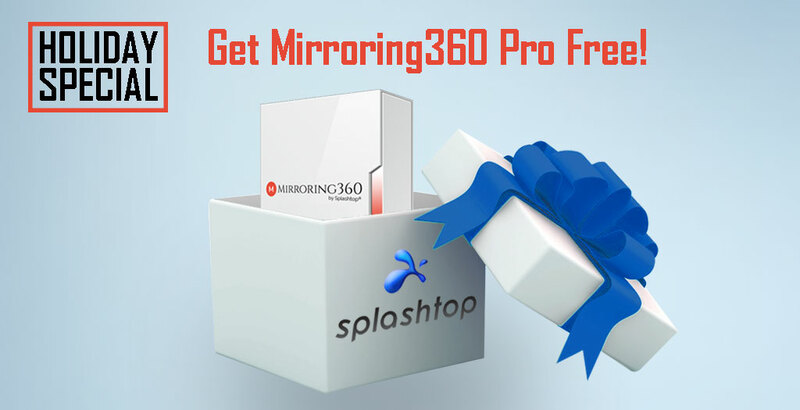 Holiday Special: Get a Free License to Mirroring360 Pro - Splashtop Inc.
OFFER EXPIRED: Thank you to everybody who participated in our Holiday Special! Upon purchase verification, you will receive an email with a free Mirroring360 Pro 1-year subscription key and instructions on where to download the software and how to install on your Windows or Mac computer and enter your key. Offer valid for subscription purchases of qualifying products listed above between November 26 and December 15, 2018. Limit one free Mirroring360 Pro license per subscription purchase. Void where prohibited. Mirroring360 Pro is designed for professionals, businesses, and schools who want the ability to mirror or cast their device screens to their computer and share their computer screen with others. You can mirror your computer, tablet, or smartphone screens to your Windows or Mac computer, and you can also share your computer screen to up to 40 participants with a simple web link. You can use Mirroring360 Pro to give product demonstrations, record tutorial videos, deliver presentations, and more! Is a credit card required for the Mirroring360 Pro subscription? A: There is no credit card required for the free license. It is a standalone prepaid subscription that expires after one year. At that point you can separately start a new Mirroring360 Pro subscription if you would like to continue with it. What if I already subscribe to a Splashtop Remote Access solution? A: You can also get the free Mirroring360 if you add users or increase the computer count on an existing subscription. Just go to my.splashtop.com to upgrade your subscription and then fill out the free Mirroring360 form after upgrading your Splashtop subscription. What if I just subscribed to Splashtop remote access within the last 14 days? A: Fill out the form for the free Mirroring360 and if your Splashtop purchase was in the past 14 days you will still be eligible for the free Mirroring360 license. If I purchase licenses for 5 users, do I get 5 free Mirroring360 Pro licenses? A: By default you receive one free license for the team owner who makes the subscription purchase. What if I don’t receive my free Mirroring360 license within 7 days? A: Contact us at sales@splashtop.com and we can look into it. What if I purchase a different product like Business Access Solo or Anywhere Access? A: Sorry but those products aren’t on the list to be eligible for the free Mirroring360 license. What if I cancel my Splashtop license or delete my account after I purchase? A: Licenses are non-refundable so if you cancel you can continue using your Splashtop remote access solution and Mirroring360 Pro through the subscription end date.